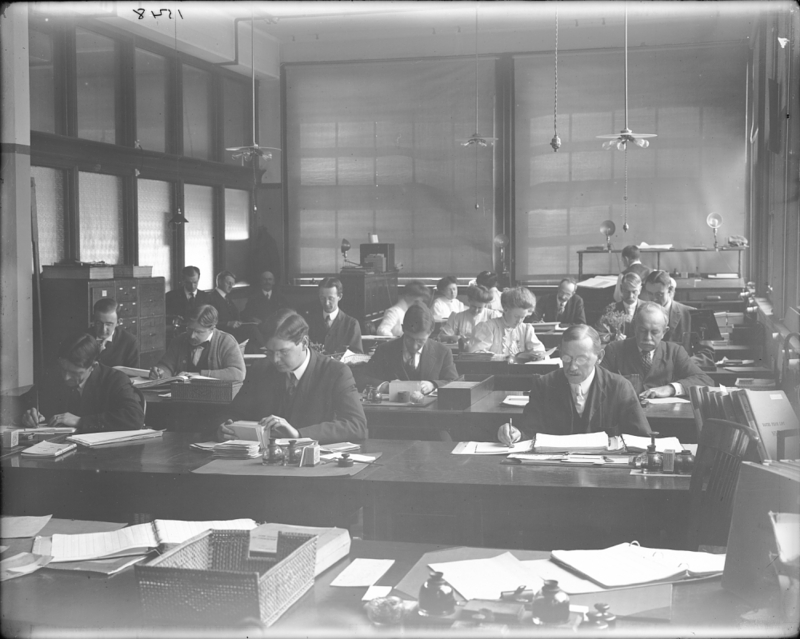 Editor's Note: This post was originally published on the Smithsonian Collections Blog as part of a 31-day Blogathon in October for American Archives Month. For baseball fans everywhere, October is a sacred time. It signals that The Fall Classic or the World Series is almost upon us. With talk of pennant races, batting averages, and future trades, it’s hard to escape baseball. While cruising through the vast holdings of the Archives Center (over 20,000 linear feet of stuff) I recently discovered a hidden gem that many baseball fans will find interesting. 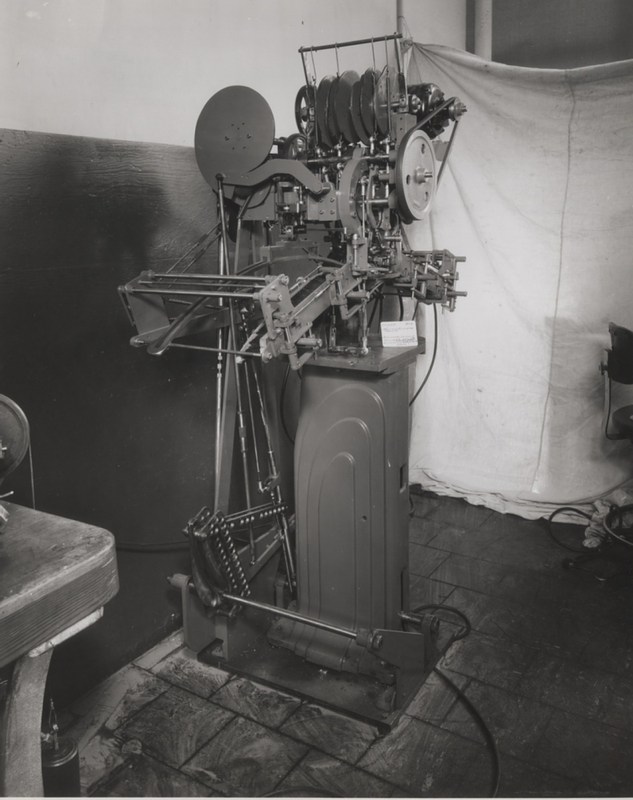 It’s the fascinating yet little known story of an experimental baseball stitching machine made by the United Shoe Machinery Corporation (USMC) of Beverly, Massachusetts. Employees in the United Shoe Machinery Corporation factory, 1955. Courtesy of United Shoe Machinery Corporation Records, Archives Center. I had a vague recollection that baseballs were hand sewn, but surely technology had caught up with this small, but significant cultural object. I guessed wrong. The baseball is a complicated little sphere. I began to delve deeper and what I discovered is that the baseball cover stitching process has resisted mechanization. An official national league baseball. The United Shoe Machinery Company was formed in 1899 by the consolidation of the most important shoe machinery firms in the industry—Goodyear Machinery Company (made machinery for sewing the sole to the upper in welt shoes), Consolidated Hand Lasting Machine Company (made machines for lasting a shoe), and McKay Shoe Machinery Company (made machines for attaching soles and heels). On May 1, 1905, the new company became officially known as the United Shoe Machinery Corporation. The main office at the United Shoe Machinery Company, 1909. Courtesy of United Shoe Machinery Corporation Records, Archives Center. The merger revolutionized shoe equipment manufacturing and the shoe industry itself. With this merger, conflicting patents were eliminated and patents supplementing each other were brought under United’s control to permit their prompt combination in a single machine or process. To ensure efficiency, the new company also continued the practice previously followed by its constituent firms of renting machinery instead of selling it. After the 1899 merger, United grew rapidly. By 1910, it had an eighty percent share of the shoe machinery market, with assets reaching forty million dollars, and it had acquired control of branch companies in foreign countries. USMC was headquartered in Boston, and its main manufacturing plant was in Beverly, Massachusetts. USMC applied the company's expertise in machine technology to other areas of development in order to diversify its product line. Under the direction of the Research Division, the company engaged in military, computer, and other automation projects. The EX files or “experimental files” in the collection represent ordinary experimentation related to the development and improvement of shoe manufacturing machinery, and work done in connection with the company's post-World War Two diversification efforts. The files cover all aspects of an experimental project, from conception through the experimental working out of problems, to the final decision to adopt or not adopt the idea for production. They also provide information on the functions of the Research Division, the manner in which it operated, and the way in which production decisions were made. In particular, they illustrate the Division's interaction and cooperation with the company's Patent Department. The files usually contain notes, technical drawings, photographs, and patent information. Schematic of mechanism for a baseball cover sewing machine designed by S.J. Finn, March 1949. Drawing by Don Hamm. Courtesy of United Shoe Machinery Corporation Records, Archives Center. The full development included an analysis of the hand procedure and how each portion of that work would be handled. The ball starts as a round cushioned cork center called a "pill," then is wrapped tightly in windings of wool and polyester/cotton yarn, and then covered by stitched cowhide. 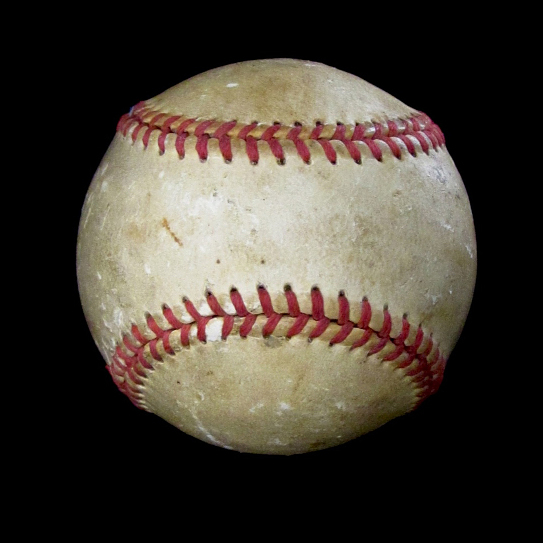 The process of assembling a baseball involves two types of workers: assemblers (who assemble the core parts of the baseball) and sewers (who stitch the cowhide covers onto the baseball by hand). There are 108 stitches in the cowhide leather of each ball, and each is done by hand. Research personnel at USMC recognized that this development would be extremely difficult and expensive. Indeed, from July 1950 to November 1961, the total expense of the project was $343,000. In 1950, the economics of baseball stitching were detailed in a cost chart. The labor rate for lacing was .15 to .20 per ball, with a production rate of five to six balls per hour. Clearly, mechanizing would increase the production dramatically. 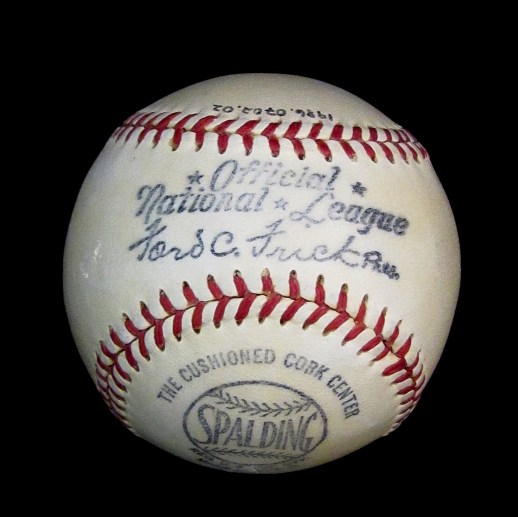 Ida Clark handmade this baseball. Engineers at USMC broke down the problem into five areas: cover assembly (lasting); needle threading; start of stitching (anchoring the first stitch); stitching or lacing; and lastly, final stitching (final thread anchoring). Previous automated machines exhibited two serious problems: they were unable to start or stop the stitching process without manual assistance, and they were unable to vary the tension of the stitches. From 1950 to 1955, the basic model work was conducted, resulting in equipment which demonstrated the operations. In 1955, formal design and detailing was initiated to resolve existing engineering and design problems and to record, in drawing form, several pieces of equipment necessary to accomplish the overall objective. Baseball stiching machine prototype. Courtesy of United Shoe Machinery Corporation Records, Archives Center. Inventors don’t work in isolation, and at USMC the development process was both shared and well documented through notebooks, memos, drawings and photographs. We are fortunate to have this documentation in the Archives Center. The baseball stitching project was a team effort. A cast of “inventive talent” was involved, principally Sidney J. Finn, who initially brought the idea forward in 1949, Otto R. Haas, and Joseph Fossa. While I found no evidence of it, I like to think that all three men were baseball fans or at least played on the company’s baseball team. W.W. Pritchard of the Research Division noted in January, 1949 that one of the problems is “the lasting of the baseball cover and that the matter should be referred to the inventive talent at Beverly to see if they can come forth with any ideas as to how this might be accomplished.” Haas’s earlier work related to baseball sewn covers (US Patent 2,840,024) and an apparatus that sews together the edges of a baseball (US Patent 2,747,529). Joseph Fossa held several patents for baseball sewing apparatus, principally methods for spheriphying baseballs (US Patent 3,178,917) and for methods of assembling by sewing the cover pieces of baseballs (US Patent 3,179,075). The “inventive talent” of Finn, Haas, Fossa, and countless other USMC engineers all assigned their patents to the United Shoe Machinery Corporation under the direction of a robust patenting programming. 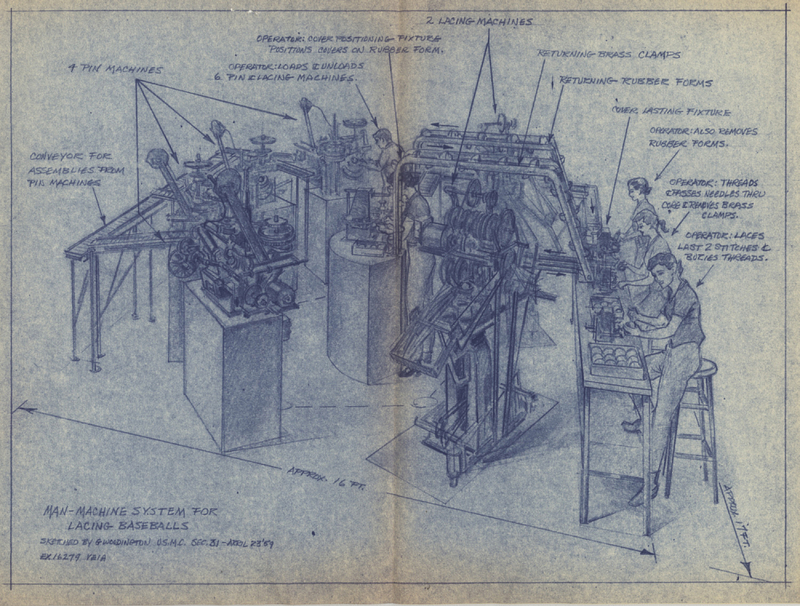 Many of the baseball manufacturers, such as A.G. Spaulding, J. de Beer and Son, MacGregor, Wilson, Lannon Manufacturing, George Young, and Tober Baseball Manufacturing Company, were aware of USMC efforts to create a stitching machine. While the customer base was limited in number, the potential revenue from a stitching machine could have been substantial. Because of insufficient interest on the part of these baseball manufacturers (at this point the baseball industry was not sufficiently organized to sponsor the development of a machine) and unresolved problems by the company’s engineers, the experimental work orders were closed. 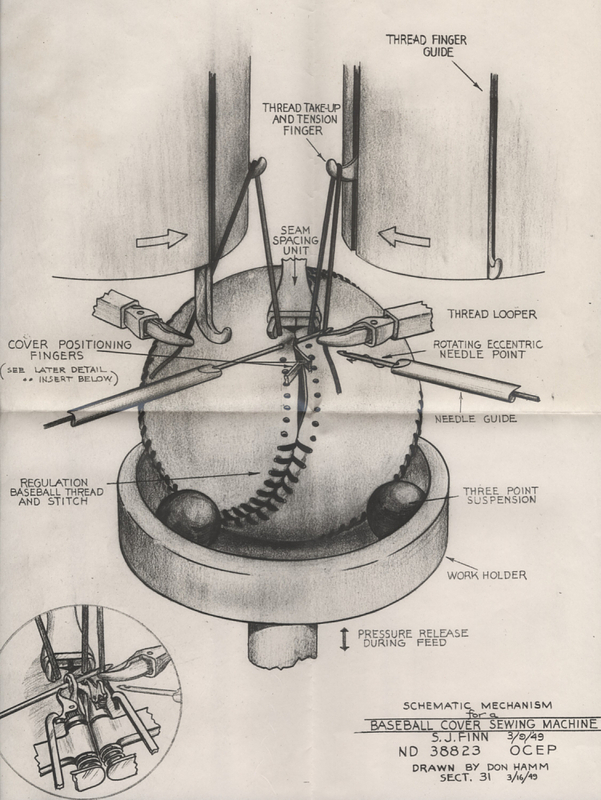 A technical drawing of the man-machine system for lacing baseballs. Courtesy of United Shoe Machinery Corporation Records, Archives Center. In 1972, Robert H. Bliss, Planning Director of USMC, wrote to R.B. Henderson, Vice President of Research and Development at AMF Voit, “Our development program was curtailed in March, 1961 when the Baseball Manufacturers Committee of Athletic Goods Manufacturing Association declined to support further development, and our management made a decision not to further fund the program without industry support.” Bliss further noted that the baseballs stitched on USMC’s model machine “were more uniform in appearance than a hand-laced ball, but there was some speculation that a major league pitcher could tell the difference and would prefer a hand-laced ball.” While the economics of the time were considered good, the company could not justify spending more money on the project. Other than increasing the company’s knowledge in the area of stitching technology, there was little likelihood that a broad application would result. Baseballs are still hand sewn. Rawlings Sporting Goods, Inc. (now part of Jarden Team Sports), in Costa Rica has an exclusive contract to produce “professional” baseballs for the Major Leagues. The amateur baseballs we throw around in the backyard are manufactured elsewhere. Attempts have been made to automate the process of stitching cowhide covers on baseballs, but none has been successful. C.B. Bateman of USMC said in August 1963, “we have a long, long way to go for a commercial piece of equipment to be presented to the trade.” And we’re still waiting. Play ball! Alison Oswald is an archivist in the Archives Center at the National Museum of American History.